Before 1941, newly-built airplanes destined for fleet units were tested by the manufacturers and ferried by pilots from those units. In other cases, reserve pilots ferried aircraft on a part-time basis. In October 1941, production increased to the point that a dedicated Aircraft Delivery Unit (ADU) was established in Hangar 6 at Floyd Bennett Field, under command of NAS New York, and with support from the Navy's Bureau of Aeronautics. Similar units were set up adjacent to manufacturing plants in Columbus, Ohio and Terminal Island, California. The ADU was composed of an Aircraft Engineering Division (AED) and Aircraft Ferrying Division (AFD). The ferrying division flew new aircraft from the factories and put in enough flight time for preliminary flight tests. Upon arrival at Floyd Bennett Field, the engineering division ran detailed checks, installed additional equipment and armament, and turned the planes back over to the ferrying division for delivery to embarkation points around the country. Ferry pilots were required to be well qualified in virtually all types of aircraft, and capable of flying routes and to airfields throughout the country. Pilots were trained at naval bases including NAS Pensacola Florida and NAS Corpus Christi Texas. Multi-engine training was conducted by American Airlines at Fort Worth, and Pennsylvania Central Airlines in Roanoke, Virginia. Between October 1941 and November 1943, the ADU commissioned 20,000 aircraft through Floyd Bennett Field and flew 5.6 million air miles ferrying aircraft. Life was simple in the ADU. 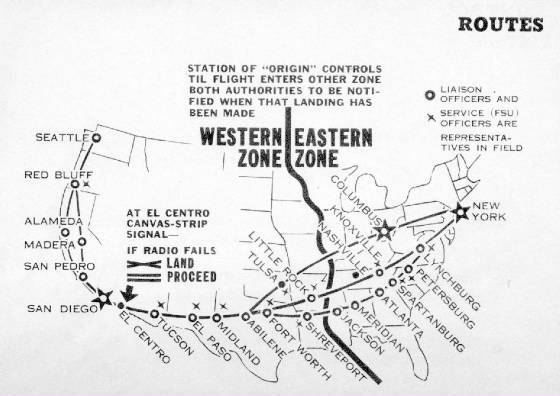 Below was the basic procedure in the early part of the war. All that changed when the ADU was replaced by the Ferry Command in Decmeber 1943 (as described on the next page). I. Report to Lt. Comdr. Whitney. II. Report to Personnel Officer, Lt. Marvin, for instructions. III. Report to Flight Training Officers, Lt. Stitt & Mrs. Whipkey for conference and submission of personal data on aviation background. 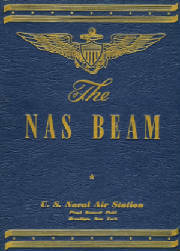 Issuance of Air Operations Manual prior to flight training. IV. Assignments, by Flight Training Section, in accordance with syllabus, to Tower, Communications and Aerology. 1) Study of Pilot's hand book. 2) Cockpit check given by a Senior Pilot. 3) Solo: flying confined to local flight. 4) Flight time required to qualify ten (10) hours. Note: After five (5) hours solo pilot may be eligible for inflight. 5) After each flight including inflight, pilot will make out chit stating his time and file with Training Section. On inflight, pilot will file with the inflight office form #1 and the Daily Flight Inspection Form. For information regarding these forms and the proper way to fill them out contact Flight Training Section. 2) Five (5) hours required to qualify but pilot may be eligible for inflight after three (3) hours. 3) Follows TBF inflight procedure. 1) Same procedure as F6F. 2) Ten (10) hours required to qualify but pilot may be eligible for inflight after five(5) hours. 3) Follow TBF inflight procedure. (a) Involves Link Trainer Program, Synthetic Training and other related subjects some of which are discussed herein. (a) Discussions on Cross Country Technique. (b) Study of maps and weather charts. (c) Contents of Cross Country Packets. 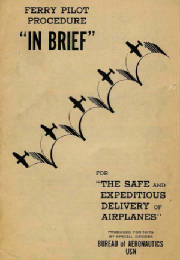 (d) Return Pilot's handbooks to Training Section by 1700 each day. THE ROUTINE SET FORTH ABOVE IS FOR THE GUIDANCE OF THE PILOTS AND IT IS REQUESTED THAT THE PILOTS ADHERE STRICTLY TO IT. HOWEVER, DO NOT HESITATE TO MAKE INQUIRIES, RELATIVE HERETO, AT THE FLIGHT TRAINING SECTION.